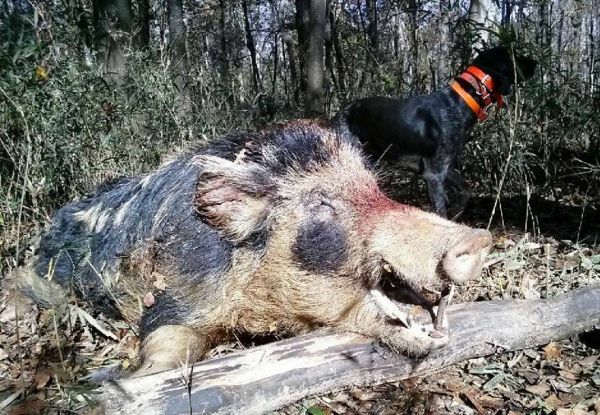 Chris Warren with Big Country Outfitters said harvesting hogs in the cold weather has been no problem lately, but he has had to make some adjustments in order to accommodate deer hunters and plantation owners. 'We don't want to run dogs for hogs during daylight because it messes up the deer hunters, and a lot of land owners don't want us to do that. But, they still have a problem with hogs, including that the hogs are eating up all the corn and crops planted for deer,' Warren said. So, Warren and his crew just hunt with dogs in the dark. Warren runs silent dogs, who don't bark while searching for hogs. They only begin making sounds once they have a hog bayed or on the run. This is very effective, as many of the hogs are sleeping, so have little chance to get away by the time the dogs are on them. Warren encourages land owners with hog problems to call him at 803-840-5184.